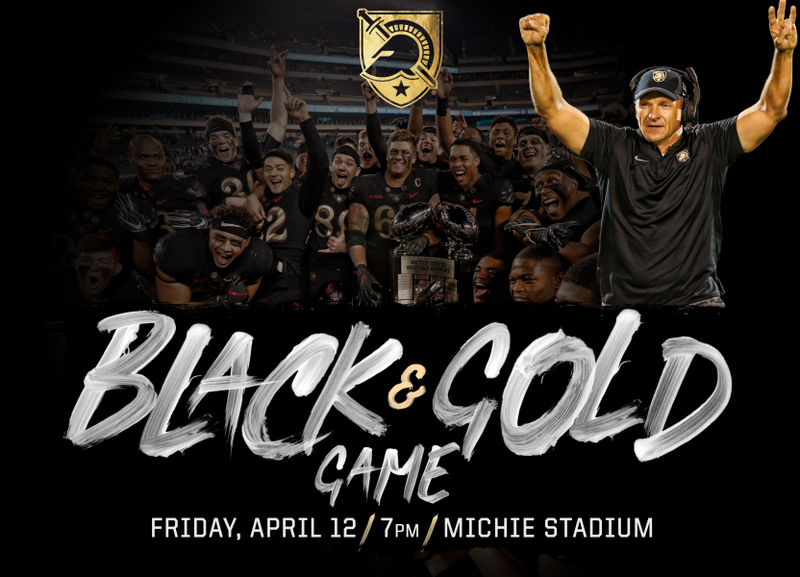 Army’s Black & Gold Game is this Friday at 7:00 pm at Michie Stadium. I think that my daughter Emma and I are going, but our schedule looks kinda tight. Still, we’re gonna try. If you’ve never been to a spring football game, they’re not exactly like regular games. I mean, yeah, the guys are all out there in their uniforms, and they (sometimes) keep score, but it’s still a little more like practice than it is an actual game. The coaching staff tries to get some work in for their starters, sure, but they’re also trying not to get anyone hurt. So they’re not gonna run any Quarterback Power or Quarterback Follow plays with Kelvin Hopkins, for example, and even if they did, it’s not clear what the point of those plays would be. Hopkins will be out there in a red no-contact jersey. How’s he gonna show his inside power without taking contact? With that, then, we usually see far more passing and pitch plays than normal, and that’s cool, but it doesn’t always look vintage Army Football. Nor is it always one hundred percent as effective. 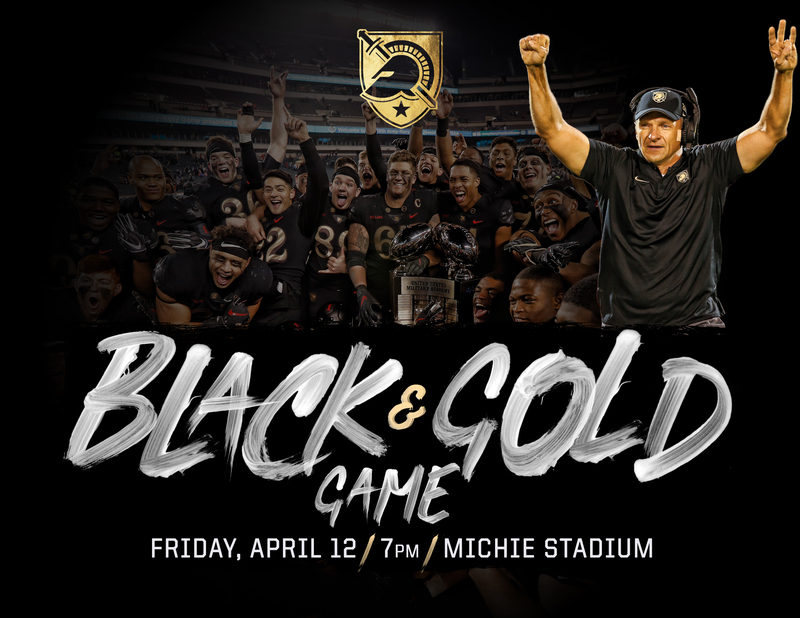 The real reason to go to the Black & Gold game is to see some of the younger guys who might contribute later this year or at some point in the future. This is one of our only chances to judge how they’re progressing for ourselves. We know established starters like Hopkins, LB Cole Christiansen, and SB Kell Walker are all going to play. But the spring gives us a chance to see guys like LB Jon Rhattigan, FB Cade Barnard, and QBs Tyhier Tyler and Jabari Laws. These guys were all highly touted recruits, and their names have come up with the coaching staff a few times over the past year, but we haven’t yet seen them on the field. Even a guy like rising cow SB Zack Boobas, who’s made real contributions a few times, hasn’t necessarily seen enough time to have left a lasting impression with the fanbase. In the spring game, however, we might very well see him break off a twenty yard run. "A physical error is acceptable, but never a mental error in what we are doing and where we should be." Unfortunately, it’s not always easy to tell who’s playing well from the sidelines. I mean, we can see it when a guy breaks away for a long run or makes a tackle behind the line of scrimmage, but we can’t always tell why those plays are happening, nor in many cases can the coaching staff until after they’ve seen the tape. Even then, it’s not like the staff is gonna break it down for the fanbase in any detail. So yeah, the spring game is fun. It’s fun even if the best we can hope for is to maybe see whether Connor Slomka or Sandon McCoy has the inside track to start at fullback (I’m betting on Slomka), or if LB Arik Smith going to start opposite Christiansen this fall (probably). However, it’s not like the staff has to make binding decisions about the two-deep this weekend. Still, getting a chance to see for ourselves beats the holy Hell out of constantly reading second-hand reports. Army Lacrosse is at Navy this weekend, and it’s a big deal for both teams. Obviously. The Women have never beaten the Mids, but they’re riding a three-game hot streak in the Patriot League, and although they’ll surely be considered underdogs, they’ve had a chance this season even against elite competition. We’ve seen them rise to the occasion several times against very good teams. Faceoff for the Women’s game is at 1:00 pm. Men’s Lax starts at 3:30 pm. Coming off a second-half collapse against Boston University is probably not the way the Men wanted to enter this contest, especially since it’s been a few years since they’ve actually won a star match despite having better teams pretty consistently for the last three years at least. But we are where we are. This year again I think the Black Knights have the better team. They’ve played better competition closer and gotten wins against legit ranked opponents. But they’ve also dropped a couple of games that they probably should have won, and for whatever reason, Navy has had their number in these star matches the last couple of years, though the Black Knights have notably outperformed in Patriot League Tournament play. The good news is that Navy Lax does not have an elite defense. Army does. So if the Black Knights can score, you’d think they’d be able to press the issue and stay on the attack. However, Army has struggled with faceoffs, and that’s a concern because it tends to put them on defense a lot more often than they’d like to be. I expect a tight game. Army really ought to win, but it will not be easy. It’a worth noting that this will be the 100th all-time meeting between Army and Navy Lacrosse, so it’d be a good time for the Army Men to show their best stuff. Coming off the series victory against Lehigh, Army sits at 17-14 with a double-header scheduled for this afternoon against Manhattan College. Deaton uses the phrase “5 like 1” to describe how no one spot on the line should be considered more important than the other. He also drops a team motto: “Tradition never graduates,” adding that the next-man-up emphasis is a constant, especially for the five guys in the trenches. Although the line isn’t yet at full strength — Johnson has been limited in practice and Peyton Reeder is still nursing a shoulder injury — quarterback Kelvin Hopkins Jr. said his bodyguards are the hardest-working position group of any. I don’t know that this counts as news, but okay. The meat of the article covers the O-Line’s annual white-water rafting trip, which sounds like a Hell of a lot of fun. The Army West Point Athletic Association has appointed Dan McCarthy ’90 Interim Director of Athletics as the department conducts a nationwide search for the Athletic Director position. McCarthy has been with the department since the start of the 2017-18 season and was added to Corrigan’s executive staff prior to the 2018-19 academic year. He joined the staff as the Associate Athletic Director for Administration after spending a season as the Director of Football Operations. McCarthy was on Jeff Monken’s staff after retiring from the military in 2017 after 27 years of service, attaining the rank of Colonel. I know a guy who’d be a good fit to replace McCarthy on the Athletic Director’s staff. I think he might take the job, too. That’s all for now, but if we make it to the game on Friday, I’ll try to file a report this weekend. Danno E. Cabeza is a Class of '95 grad, former Army Swimmer, and now the Senior Writer at As For Football. As For Football is a collaborative effort to provide satire, mirth and Army Football spirit to the Gray lives of Cadets and Old Grads alike. Attention all Cadets, it is Army Season! The Uniform is As For Football, bleeding black and gold, carrying a dose of satire and unyielding optimism!